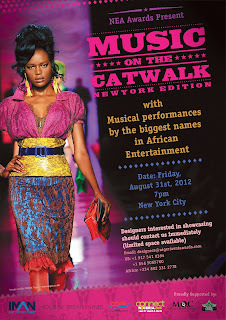 For the first time in its seven year history, the Nigeria Entertainment Awards will be hosting a fashion show titled Music on the Catwalk as part of its lineup of events for the 2012 NEA Awards weekend. Keeping in line with the overall mission of promoting and celebrating Nigerian entertainment industry, the producers of the NEA Awards in partnership with the Music on the Catwalk franchise will be hosting a fashion show event here in New York City. Music on the Catwalk will feature 7 international, and emerging African designers – Sally Bawa, Vonne Couture, Single Button, Elégante, Revere Couture, Glamm Fashions and Isi Atagamwen. The event venue is the Helen Mills Theater located on 137-139, 26th str. with red carpet arrivals slated for 7pm sharp, and show time for 8pm. All designers are excited to be showcasing in New York City one of the famous fashion capitals of the world, and home to the one and only New York Fashion Week. Aside from the fabulous collections being showcased, other highlights include having M-Net’s Face of Africa, Oluchi in attendance, with model and reality show star Uti Nwachukwu walking the runway. Guests will be treated to musical performances from SamKlef, Awon Boyz, Olamide and Hoodbilli. Part of the proceeds from the show will go to the Exodus Guild Foundation; a foundation geared towards making life easier for people with disabilities by imparting stability, independence, and self-esteem. The founder, Ms. Funke Akinbuli described this partnership as a great opportunity for added visibility for the cause, and was optimistic about the way forward. Music on the Catwalk is presented by Arik Air, and supported by Iman Entertainment, ConnectNigeria, Popchips, Vitamin Water, Zico, HVS, MAYVEN PR, 745Ent., BellaNaija, Jaguda, Underdarock, OK!Nigeria, and AIT.